IMH is specialised in the manufacture, delivery and assembly of piping for applications such as waste water plants, painting facilities, biogas systems, the automotive industry and general industrial uses. We also prefabricate systems or components at our plant in Burgtonna and assemble them on site. Whether in Germany or elsewhere, each of these jobs presents us with new challenges and opportunities to prove our competence. In overcoming these challenges, we have built up a highly skilled and flexible team in Burgtonna. IMH consists of qualified pipefitters, TÜV-certified TIG welders and assembly mechanics. Our company is certified according to Section 19 of the German Water Resources Act and DIN DVGW (the German Technical and Scientific Association for Gas and Water). Industriemontagen Hofmann e.K. 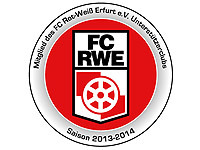 has been an official supporter of the football club FC ROT WEISS ERFURT e.V. since 2007. IMH further supports the FC Rot Weiss Erfurt with a 9-meter banner in the TV area of the station. Sponsor of the SG Ufhoven 1994 e.V.